Over the past 25+ years the Chicago Smelts have developed a great relationship with Gill Park Recreation Center. We're actively involved in Gill Park and its programs, and donate pool equipment to support the Gill Park Gators youth swim team. Since 2011 the Chicago Smelts have participated in Northwestern University Women's Swimming & Diving Team's hour-long, non-stop breaststroke relay alongside fellow swimmers from the Chicago area. We're proud to be part of this grass-roots effort to raise funds for the Lynn Sage Cancer Research Foundation at Northwestern Memorial Hospital. The team frequently volunteers at Pride Fest and other summer street festivals. These serve as team fundraisers, and, most importantly, are great bonding experiences with teammates and a fun way to interact with the community. Since its inception in 2007 the Chicago Smelts have been supporting the Center on Halsted. The Center is the Midwest's most comprehensive LGBTQ community center. More than 1,000 community members visit the Center every day, located in the heart of Chicago's Lakeview Neighborhood. A part of Chicago’s LGBTQ Pride Week activities since 1982, Proud to Run (PTR) is an annual 10K run & 5K run/walk along the lakefront, focused on celebrating pride in a healthy way and raising funds to support the greater Chicago LGBTQ community. The Chicago Smelts volunteer by manning a hydration station and cheering all of the runners. Making waves to cure cancer! 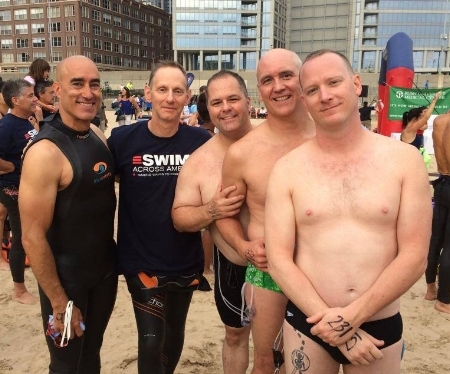 Several Smelts swim each July in the annual Swim Across America open water event in Lake Michigan to raise much needed funds to fight cancer. Join the team at Ohio Street Beach or make a $ contribution.